Your weight doesn’t have to weigh you down. Fat Albert is fat alright, but he stays active. He is always shown participating in sports and other activities with the rest of the gang. He doesn’t let his size slow him down, and stays healthy through exercise. A life of crime has consequences. 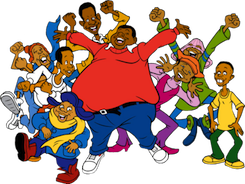 Fat Albert and the gang meet numerous characters who live outside the law. Each time they prove that crime doesn’t pay and that it’s best to do honest work to make a living. Reading really is fundamental. One of the kids in the neighborhood can’t read. He’d rather watch football and that choice nearly gets him killed when he can’t read a warning sign at a construction site. Everyone has something to offer. When a kid named Pee-Wee is left out of basketball games because of his small size, he’s ready to throw in the towel. He proves to be a football star with his kicking ability and proves to everyone that he’s got athletic ability after all. We should talk out our differences rather than fight. Fat Albert shows us that people can settle differences without having to resort to violence. Rival gangs play sports instead, or compete in other ways, and nobody gets hurt. It’s cool to stay in school. Throughout the series, we learn how lives are affected by a lack of education. Dropouts can’t find jobs, or pay their bills. Opportunities in life are severely limited for those who lack a proper education. People should be treated as individuals, not stereotypes. When the gang meets a Native American, they think he’s able to make it rain like they’ve seen in movies. After they read up and learn about real life Native Americans, they develop a respect for Johnny as a person. Smoking can kill you. Fat Albert warns the gang about the hazards of smoking when they all take up the habit thanks to Wambly, who convinces them it’s cool. Wambly’s dad nearly dies from his smoking habit, teaching everyone that Albert was right. Music comes from the soul. All the gang have musical instruments made out of cast-off parts and pieces of assorted hardware. Yet they make great music together despite their makeshift instruments and lack of formal musical training. You can live a moral life and still be cool. In the rough streets of North Philly, there’s always the temptation toward a life of crime in order to get by and be part of the crowd. Fat Albert’s gang shows that you can do the right thing, and be a part of something even better.